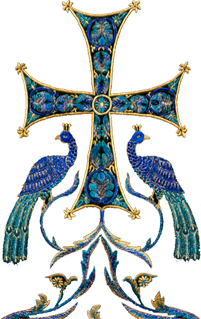 The fifth week of Great Lent sees a Matins service that has come to be known as the "Standing of St. Andrew." During this service, for the only time throughout the year, the Great Canon of St. Andrew of Crete is read in its entirety, which had been read in four parts during at the beginning of Great Lent. Also read at this service is the life of Venerable Mary of Egypt, composed by the Holy Hierarch Sophronius, Patriarch of Jerusalem. On Wednesday, April 10, Eastern American Diocesan vicar Bishop Nicholas of Manhattan led the reading of the Great Canon in the Synodal Cathedral of the Sign in New York City. Co-serving with His Grace was the cathedral clergy: senior priest Archpriest Andrei Sommer, Archpriest Edward Chervinsky, and Abbot Eutychius (Dovgan). 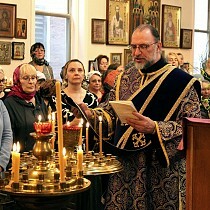 At the same time, the rector of the English Mission, Abbot Zosimas (Krampis), read the Canon of St. Andrew of Crete in English in St. Sergius Chapel in the Synodal Headquarters. The reading of the Canon of St. Andrew and the life of Mary of Egypt on the fifth week is a practice that has been preformed by the Church since the Sixth Ecumenical Council.